A weekend away from the pressures of the beginning of the new school term saw me heading to Glasgow one Friday evening in September 2008. Forty two pounds return first class seemed a pretty good way of starting this short break. 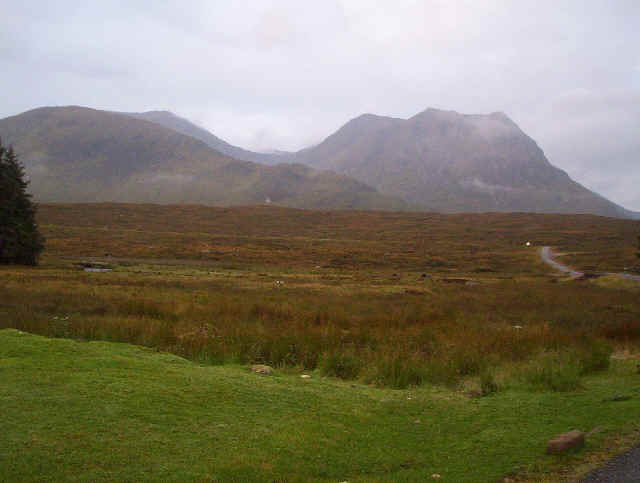 An early start on Saturday found me at Glasgow Buchanan Street bus station for the 7.00am Citylink bus to Uig, which I took as far as the White Corries ski centre in Glencoe. 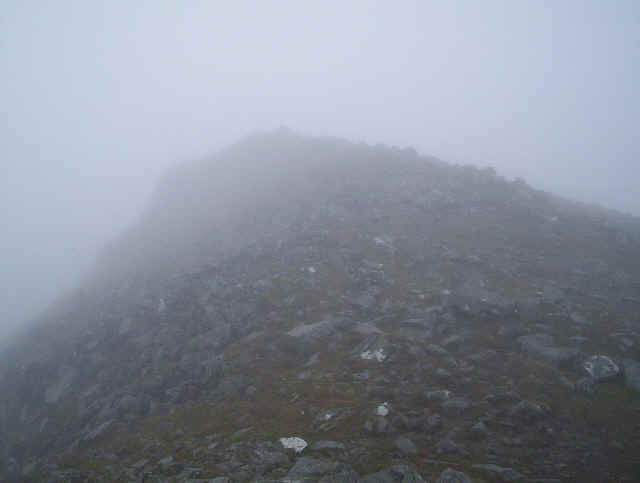 The original plan had been to climb Buchaille Etive Mor but the weather wasn't co-operating, with light drizzle and very low cloud. There seemed little point in climbing the Buchaille since I really wanted the views from this mountain down Glen Etive and I certainly wasn't in the mood for coping with lots of slippery rock. The view of Meall a' Bhuridih, if anything, is even worse!! Still, it beats being at home in England. 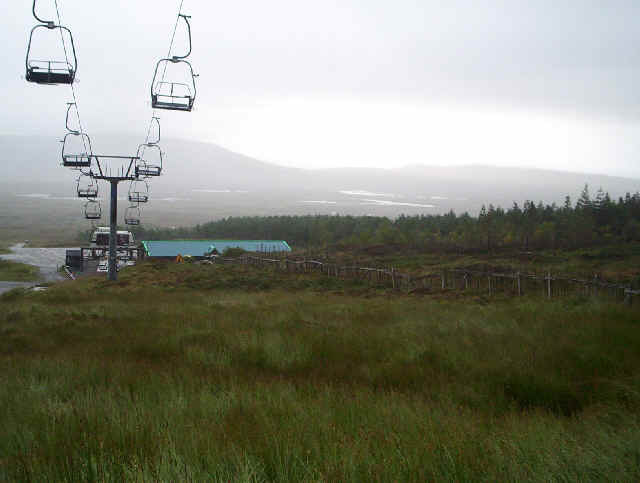 Leaving the ski centre the footpath is clearly marked, as is the mountain bike path. Surely, there can be few more outdoor activities more scary than hurtling out of control down a mountainside on a bike? 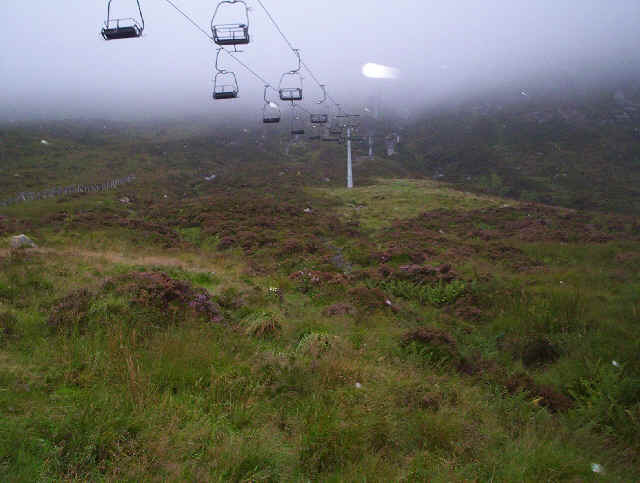 Whilst I was climbing by the chairlift it suddenly burst into life to carry a cyclist up the hill. 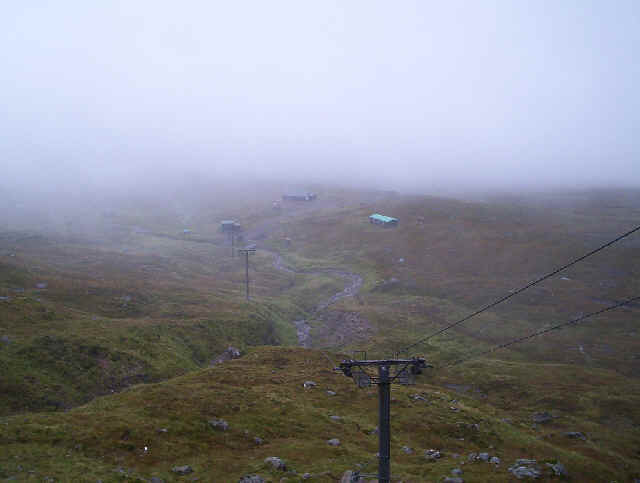 The path follows the chair lift steeply uphill for the first section of the walk to the summit. 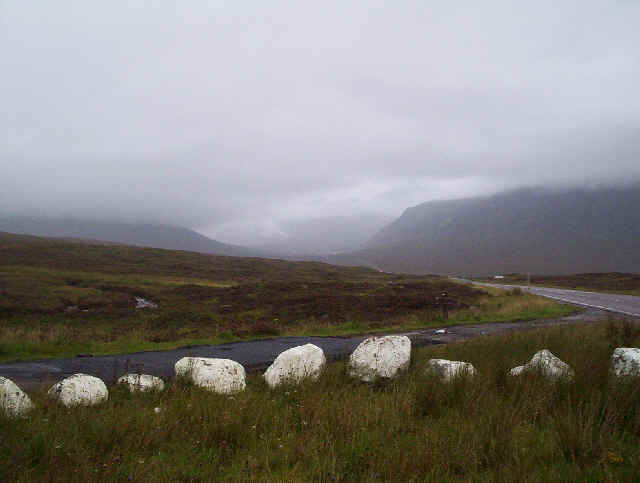 For a short time I had a view of sorts looking back over Rannoch Moor but very soon all views disappeared. A rough path climbs by the side of the main chair lift to the top of the main access chairlift. From here a broad vehicle path heads SW across the moorland. 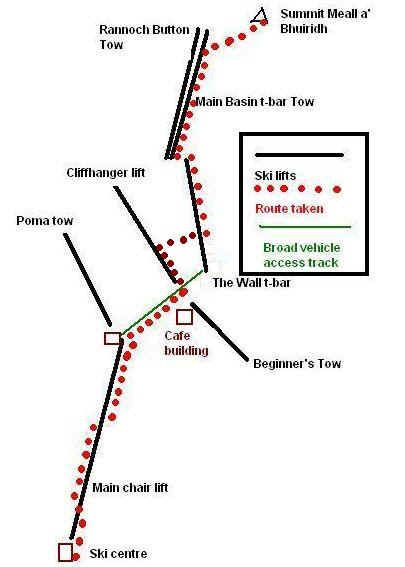 On reaching the Plateau Cafe building I initially followed a path underneath the Cliffhanger lift. However, this path crossed a gully, with the lift wires high above and disappeared into crags. I wasn't happy about scrambling among rocks in poor visibility but at this point the missed cleared momentarily and I was able to see the masts of The Wall t-bar lift. So I cut across the hillside to reach t-bar lift and followed a clear path up to the buildings at the top of the lift. Here another vehicle track leads across a badly damaged wooden bridge to reach the two tows that go up almost to the summit. I found walking up by the ski lifts a pretty dismal experience; it reminded me too much of the damage done in the Alps by the ski industry. Watching out for cables and bits of rubbish isn't what I usually climb mountains to see!! i decided therefore that I would be taking a different route down the mountain. 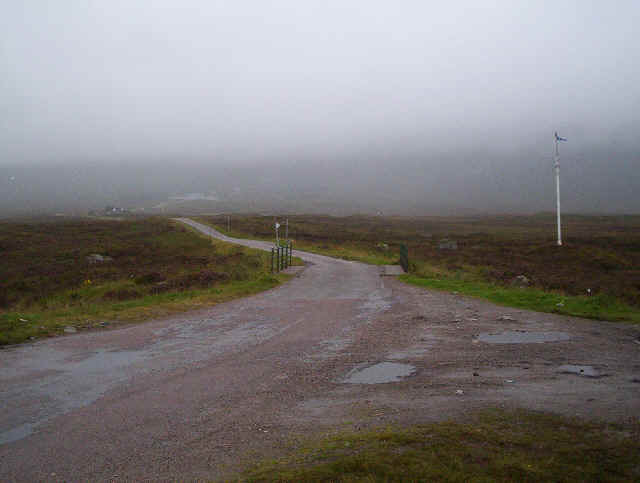 The summit of Meall a'Bhuiridh looms out of the mist two hours after leaving the main road. There's a steep drop to the south side into coire an Easain and a much more gentle slope to the NNE which I would follow later. 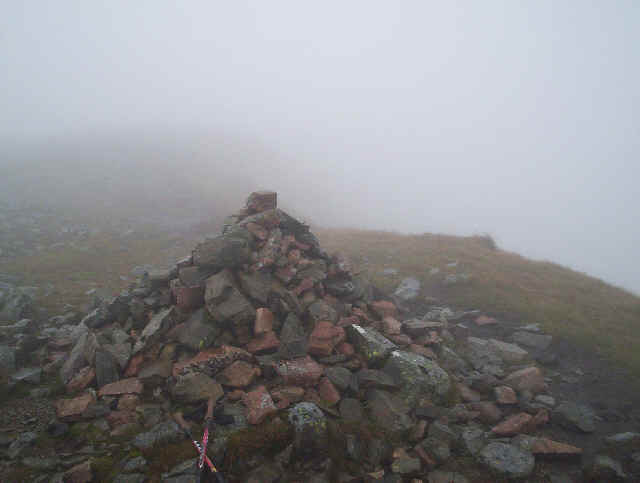 As I reached the summit (1108) two other walkers arrived having come up by the route I intended to take down. Since they were going on to climb Creise we decided to walk together. Should Muriel from North Berwick and Ann from Edinburgh read this thanks for your company and conversation. 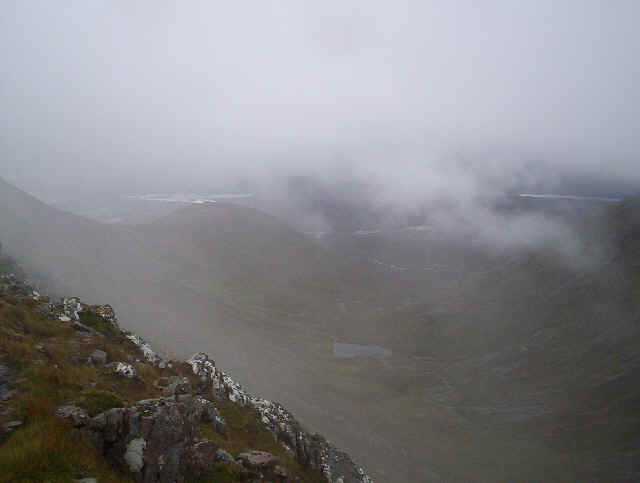 Creise was to be by 47th Munro whilst it was Muriel's 7th last. 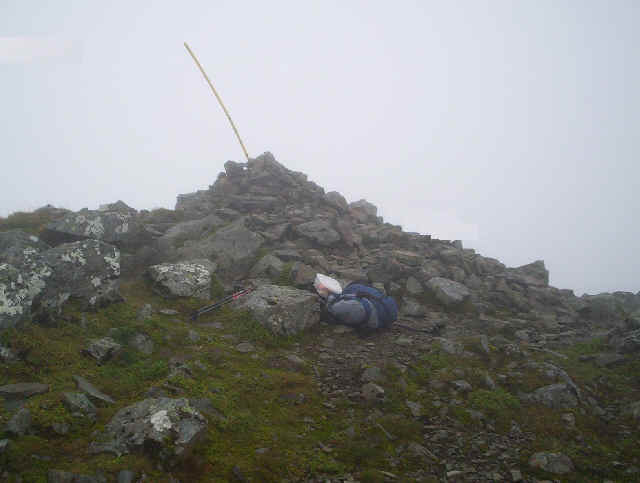 Ann had already completed all the Munros so I was clearly in nillustrious company. Sadly, the clouds stayed firmly down over the hill but we set off down the rocky west ridge to the col between the two hills. I'd read that the climb to Creise was steep and a bit tricky. There were one or two largish steps up but nothing particularly difficult. In winter, of course it would be different. The track arrives suddenly on the flat top at a large cairn. Marking this in our GPS's we set off across the stony top to the summit of Creise at 1100m. The summit cairn of Creise stands quite close to the edge of the cliffs on the East side of the hill. Some inconsiderate person had tried to hide a drinks can under a stone so I took it back down the hill to dispose of it properly. 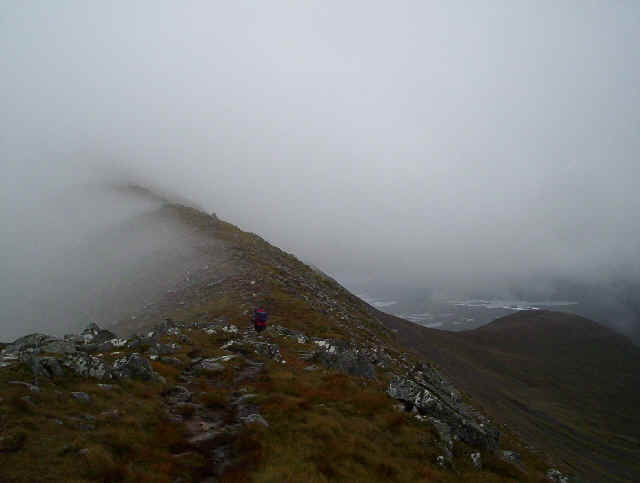 the retunr route was back over Meall a'Bhuiridh. A view at last. The clouds cleared slightly as we re- crossed the col between the two hills. 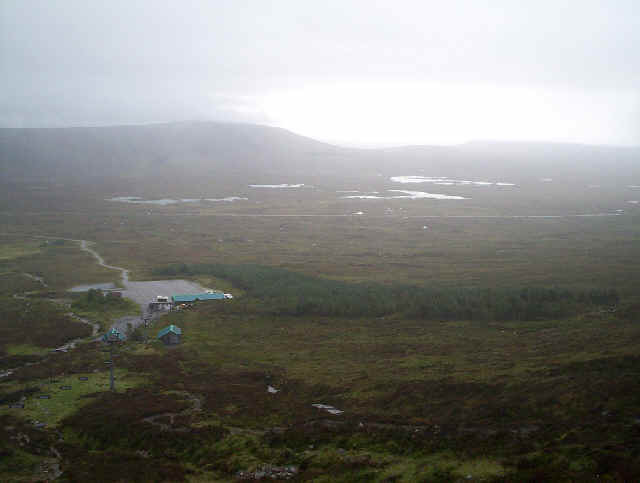 Down below can be seen Lochan Easain with more lochs visible over on Rannoch Moor. Beginning the climb back up to Meall a'Bhuiridh. The return route was down the NNE slopes to reach the bottom of the ski tows near the cafe and then down the path by the chair lift. Although the weather hadn't been very kind at least the forecast heavy rain and high winds hadn't appeared. After a night at the Kings house Hotel I woke to find better visibility so at least I was able to see what the hills actually looked like.